This hotel operator management agreement is for the management and operation of a large hotel. While it contains duties for the operator relating to the pre-opening period when the hotel has not yet opened for business, it also details the operator's management duties after the property is opened to the public. The hotel operator is to be compensated by a base fee as well as incentive compensation calculated upon income before fixed charges in excess of a stipulated amount. The operator has well defined responsibilities under the agreement for financial reporting, and preparation of business plans for the property, as well as general hospitality management duties. 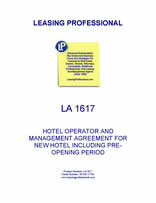 Type Hotel operator and management agreement for a large hotel. The agreement covers the pre-opening period as well as when the hotel is open and operating normally. The agreement contains detailed definitions for the terms used in its provisions. The operator is to receive a base management fee equal to a specified percentage of hotel gross revenues. In addition, the hotel operator receives incentive fees equal to a certain percentage of income before fixed charges in excess of a stipulated amount. The hotel operator is responsible for preparation of an annual business plan for the property. The agreement imposes extremely specific management duties upon the operator relating to the appointment of management staff, establishment of pricing for hotel services, negotiation of service contracts and concession agreements, obtaining necessary permits, supplies, and so forth. This Hotel Management Agreement (this “Agreement”), dated ___________, 20__, is by and between AGREEABLE HOTEL PROPERTIES, INC., a __________ corporation, (“Owner”), and SMOOTH OPERATOR, LLC, a __________ limited liability company (“Manager”). A. Owner has entered into a contract for the purchase of (i) certain real property described on Exhibit A attached hereto and incorporated herein (the “Real Property”), and (ii) all improvements upon the Real Property (the “Improvements”) including, without limitation an existing hotel known as __________________. The Real Property and the Improvements are herein collectively called the “Hotel”. B. Manager is qualified to operate, direct, manage and supervise the Hotel. C. Owner desires to turn over to Manager the operation, direction, management, and supervision of the Hotel and Manager desires to assume all such responsibilities as agent for and on the account of Owner upon the terms and subject to the conditions set forth in this Agreement. AAA means the American Arbitration Association. Accounting Period means each of twelve (12) accounting periods of one (1) calendar month occurring each Fiscal Year. Affiliate means any person or entity that directly or indirectly through one or more intermediaries, controls or is controlled by, or is under common control with, Manager or Owner, as the case may be. For purposes of this definition, the term “control” means the power to direct or cause the direction of management and policies, through the ownership of voting rights, by contract or otherwise. Agency Account shall have the meaning set forth in Section 8.1 of this Agreement. Agreement means this Management Agreement. Annual Business Plan means the detailed annual business plan for the operation of the Hotel for each Fiscal Year prepared by Manager pursuant to Section 10.1 of this Agreement. Base Management Fee means the amount payable to Manager pursuant to Section 11.1(a) of this Agreement. Benefit Plans means all employee benefit plans of Manager, which include, without limitation, a 401(k) plan, a bonus and incentive plan, and a health insurance plan. Books and Records shall have the meaning set forth in Section 9.1 of this Agreement. Capital Reserve Fund shall have the meaning set forth in Section 8.4 of this Agreement. Contract Commencement Date means _________________, 20__. CPI means the Consumer Price Index - Seasonably Adjusted U.S. City Average for All Items for All Wage Earners and Clerical Earners (1982-1984 = 100), published monthly in the Monthly Labor Review by the Bureau of Labor Statistics of the United States Department of Labor (the “CPI-W”). If the CPI-W is discontinued, CPI shall mean the Consumer Price Index - Seasonably Adjusted U.S. City Average for All Items for All Urban Consumers (1982 - 1984 = 100) (the “CPI-U”). If both the CPI-W and CPI-U are discontinued, comparable statistics on the purchasing power of the consumer dollar published the Bureau of Labor Statistics or any other agency of the United States government shall be used. Environmental Laws means any and all present and future Laws (whether common or statutory), now or hereafter in effect, promulgated or entered thereunder by any federal, state or local governmental entity relating to public or employee health and safety, pollution or protection of the environment including, without limitation, the Comprehensive Environmental Response, Compensation, and Liability Act of 1986, as amended by the Superfund Amendment and Reauthorization Act of 1986, and the Resource Conservation and Recovery Act, as all of the foregoing may be amended from time to time. FF&E means all furniture, furnishings, equipment, fixtures, apparatus and other personal property used in, or held in storage for use in, the operation of the Hotel, other than Operating Equipment, Operating Supplies and fixtures attached to and forming part of the Hotel. Financial Statement shall have the meaning set forth in Section 9.2 of this Agreement. Fiscal Year means a calendar fiscal year starting on January 1 and ending on December 31, or portion thereof depending upon the Contract Commencement Date and the Termination Date. Franchise Agreement means the Franchise Agreement dated _______________, 20__, between _______________ and Owner. Gross Revenues shall mean all revenues and receipts of every kind derived from the operation of the Hotel and all departments and parts thereof including, without limitation, income (from both cash and credit transactions) from the rental of guest rooms, telephone charges, stores, offices, exhibit and sales space of every kind; license, lease and concession fees and rentals (but excluding gross receipts of licensees, lessees and concessionaires); income from vending machines; net income from parking; health membership fees; food and beverage sales; wholesale and retail sales of merchandise; service charges, and proceeds, if any, from business interruption or other loss of income insurance. Expressly excluded from the definition of Gross Revenues are the following: gratuities to employees of the Hotel; federal, state, and local excise, sales or use taxes or any other taxes collected directly from patrons or guests or included as part of the sales price of any goods or services; proceeds from the sale of FF&E; insurance proceeds (other than proceeds from business interruption or other loss of income insurance; condemnation proceeds (other than for a temporary taking); any proceeds from any sale of the Hotel or from the refinancing of any debt encumbering the Hotel; contributions by Owner; or damage awards received from third parties. Group Services means group benefits, services, and facilities generally made available by Manager at other properties owned or managed by Manager, including, where applicable, convention, business and sales-promotion services; advertising and public relation services; centralized reservation services; computerized management information services; educational and training programs and facilities; central purchasing and procuring services; employee benefits administration; payroll administration; and risk management services. Group Services does not include Manager's central office overhead and general office and administrative expenses (as opposed to that of the Hotel). Hotel means the Real Property and the Improvements. Improvements shall have the meaning set forth in Recital A of this Agreement. Incentive Fee means the amount payable to Manager pursuant to Section 11.1(b) of this Agreement. Income Before Fixed Charges means the excess, during each Fiscal Year (and proportionately for any period less than a Fiscal Year), of Gross Revenues over expenses and deductions incurred in the operation of the Hotel by Manager in fulfilling its duties hereunder during such Fiscal Year, determined in accordance with the accounting system established by the Uniform System (except as modified by this Agreement). In arriving at Income Before Fixed Charges, all expenses shall be proper deductions from Gross Revenues insofar as they relate to the operation of the Hotel excluding only Incentive Fees, real property taxes, personal property taxes, casualty and liability insurance premiums and deductibles, equipment lease payments, ground rent, interest, depreciation, and amortization. Laws means any and all laws, rules, regulations, requirements, orders, notices, determinations and ordinances of any federal, state, municipal or other authority having jurisdiction over the Hotel, now or hereafter in force, including, without limitation, any alcoholic beverage control board, health inspectors, the Board of Fire Underwriters and any insurance companies covering any of the risks against which Owner or Manager are insured under this Agreement. Letter of Intent shall have the meaning set forth in Section 15.3 of this Agreement. Management Fees means the aggregate of the Base Management Fee, Incentive Fee and Monthly Centralized Accounting Fee. Manager means SMOOTH OPERATOR, LLC, a __________ limited liability company. Manager Indemnitees shall have the meaning set forth in Section 17.1 of this Agreement. Monthly Centralized Accounting Fee means the amount payable to Manager pursuant to Section 11.1(c) of this Agreement. Net Operating Income means the amount equal to Income before Fixed Charges less real property taxes, personal property taxes, casualty and liability insurance premiums and deductibles, Incentive Fees, lease payments and replacement reserves. Opening Date shall mean the first date upon which the Hotel shall be deemed open to the public for operation during the term of this Agreement. Operating Budget means the operating budget prepared by Manager for the Hotel for each Fiscal Year for which each Annual Business Plan is prepared, setting forth an itemized statement of any and all anticipated costs and expenses to be incurred in connection with the operation, direction, management and supervision of the Hotel for such Fiscal Year. Operating Equipment means all equipment, except for FF&E and Operating Supplies, used, or held in storage for future use, in connection with the operation of the Hotel including, without limitation, all dishes, platters, serving trays, china, glassware, linens, silverware, uniforms and all kitchen, restaurant and bar equipment. Operating Funds shall have the meaning set forth in Section 8.2 of this Agreement. Operating Supplies means all supplies, except for FF&E and Operating Equipment used, or held in storage for future use, in connection with the operation of the Hotel including, without limitation, all engineering, maintenance and housekeeping supplies and all food and beverages of all kinds. Section 2.1 Term. The term of this Agreement shall commence on the Contract Commencement Date, and shall continue until the fifth anniversary thereof (the “Original Term”) unless sooner terminated by Manager or Owner pursuant to the provisions of this Agreement. The date this Agreement actually terminates shall hereinafter be called the “Termination Date”. Section 2.2 Renewal Terms. This Agreement shall be automatically renewed for one five-year term (“Renewal Term”) unless either party to this Agreement provides written notice to the other party on or before ninety (90) days prior to the expiration of the then current Original Term or Renewal Term as the case may be, that it elects not to renew this Agreement. The rights and obligations of Owner and Manager during any Renewal Term shall be governed by the terms and conditions of this Agreement as if such Renewal Term was the Original Term. Section 3.1 Engagement of Manager to Manage Hotel. Owner hereby grants to Manager the sole and exclusive right, and hereby appoints Manager as Owner's sole and exclusive agent, subject to the terms of this Agreement, to operate, direct, manage and supervise the Hotel without interference from Owner, and Manager hereby undertakes and agrees to perform, as the agent of and for the account of Owner, all of the services required hereunder and to comply with all of the provisions of this Agreement. Section 3.2 Contract Commencement Date; Opening Date. Subject to the provisions contained in Article IV below, Manager shall assume operation, direction, management and supervision of the Hotel at 12:01 A.M. on the Contract Commencement Date. If the Opening Date fails to occur on or before ___________, 20___, Manager shall have the right to terminate this Agreement as of such date upon ninety (90) days prior written notice to Owner. Section 3.3 Manager as Agent. Manager, and all employees of Manager working at the Hotel, shall act solely on behalf of and as agent for Owner and not on its own behalf. Nothing contained in this Agreement shall be construed as creating, between the parties hereto or with any third party, a partnership, joint venture or any relationship other than agency. Any and all debts, obligations and other liabilities incurred by Manager in connection with the Hotel shall be incurred on behalf of Owner, and Manager shall not be liable for payment therefor. Section 4.1 Pre-Opening Period From and after the Contract Commencement Date until the Opening Date (the “Pre-Opening Period”), Manager shall perform the pre-opening services described in this Article IV. Section 4.2 Pre-Opening Business Plan.